We are delighted to announce a series of exhibitions worldwide, celebrating the life and work of Ray Harryhausen. As part of our ongoing #Harryhausen100 program, these exhibits will allow fans to get close to some of Ray’s most iconic creations. We are delighted to announce that the largest and widest ranging exhibition of Ray Harryhausen’s work ever seen will take place at the National Galleries of Scotland, Summer 2020. The Scottish National Gallery Of Modern Art will host a celebration of Ray’s life and creations to mark the centenary of this legendary filmmaker and artist. More details will follow as our exhibition plans develop. Items from Ray Harryhausen’s Science Fiction collection will be displayed as part of this genre-defining exhibition. This unprecedented programme will showcase an all-encompassing exploration of the genre, from its roots in classic literature, through to modern day cinema blockbusters. 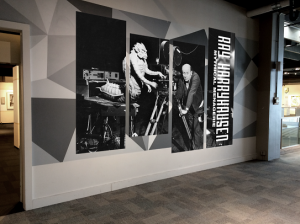 As such, this will be a unique opportunity to view Ray’s creative output within the wider context of the history of science-fiction. The exhibition will showcase newly restored models, artwork and lost treasures from some of Ray’s most beloved films. Following a successful first phase at the Barbican Centre in London, the exhibition will now tour Europe, with further dates and locations to be announced. The Ray and Diana Harryhausen Foundation is a registered Scottish Charity (No. SC001419) and recognised by the US Internal Revenue Service as a Foreign Tax-Exempt Organisation. The registered office of the Foundation is Princes Exchange, 1 Earl Grey Street, Edinburgh EH3 9EE, UK. Yesterday marked the birthday of legendary composer, Miklos Rozsa (18/04/07 – 27/07/95).